NSS together with CyberArk and Sophos will inform you of the latest cyber threats and will suggest ways to address them at the 9th Infocom Conference on 17th and 18th of April – Dais Conference Center. The concept of Industry 4.0 (aka the 4th Industrial Revolution), has begun to be reported more and more, reflecting the utmost modernization and rapid development of all the levels of the production, services and procedure, with the main pillar of all the new and advanced technologies that bring us a revolution in the way that private businesses, public organizations and societies operate. The basis for Industry 4.0 is the combination of the natural and digital world. The interconnection of machines with information and communication systems and the complete digitization of physical procedures through the combination of existing and emerging technological trends such as Cyber ​​Physical Systems, Artificial Intelligence, Augmented Reality, and the Cognitive computing, as well as Big Data, cloud computing and cryptocurrencies. 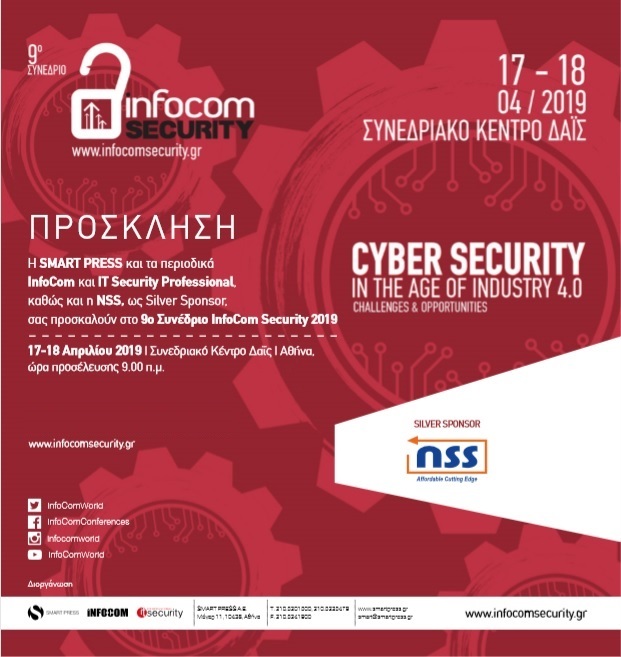 In this new era, the Digital Security sector, if we include Information Security, Networks and IT infrastructures also Data Protection, is to have a very important role, creating new challenges and new opportunities that we will present at the 9th Infocom Security Conference, to be held on 17 and 18 April at the Dais Conference Center at Maroussi Athens. Cyber ​​Security, in all aspects, is vital importance to the effective understand and use all the new technologies that can lead us to the 4th generation Digital Revolution, and that’s why all the professionals should be fully informed about the evolution of cyber-threats, the trends and the strategies that are developed in the field of security, new technologies and new generation protection solutions. This need for information on Digital Security – with a business-oriented approach, but also scientific, research and technological interest – the Infocom Security Conference will fill for one more year. Infocom Security Conference is the reference point for the security specialist and the place of their annual meeting. During the 9th Infocom Security, parallel workshops will take place, offering techniques and practical presentations by specialists about information security issues. During the 9th Infocom Security -like every year- there will be an expo for sponsor companies, giving visitors the opportunity to get in touch with businesses active in the country, in the sector of information security services and solutions, in order to stay informed face-to-face about all developments in this area, as well as their own activities.